It’s October and Halloween is just around the corner. So I set out to find something creepy in the Trade Literature Collection. I already knew there are a lot of catalogs for undertakers’ supplies so I decided to start there. At first, I came across catalogs focusing on what you would expect–coffins and caskets. There were also related items, like pillows and linings for caskets. But then I came across a catalog from National Casket Co. which was definitely different from the others and not at all what I expected to find. National Casket Co., Baltimore, MD. National Styles, Dry Goods Catalogue 16-B, ca. 1915, front cover. National Casket Co., Baltimore, MD. National Styles, Dry Goods Catalogue 16-B, ca. 1915, title page. National Styles, Dry Goods Catalogue 16-B advertised clothing. But after reading the first page and also knowing the name of the company, it was clear that this was not an ordinary clothing catalog. This company sold clothing for the deceased. The clothing was known as the “National” line and included high-class dresses and suits which undertakers could sell with a casket. The ladies’ dresses were manufactured under the supervision of dressmakers while a custom tailor oversaw the making of the men’s suits. National Casket Co., Baltimore, MD. National Styles, Dry Goods Catalogue 16-B, ca. 1915, pages 12-13, Ladies’ Dress No. 3116-K 4811 and Ladies’ Dress No. 3287-285. It looked just like regular clothing, but there was still something eerie about it. People were dying to get into these clothes! Many of the women in the illustrations held flowers. A few held fans or what appeared to be a card or book. A lot of the people’s expressions had faraway looks. The dresses were made of silk, chiffon, satin, or cashmere. This dress below on the right, available in black or grey, was made of cashmere. National Casket Co., Baltimore, MD. National Styles, Dry Goods Catlaogue 16-B, ca. 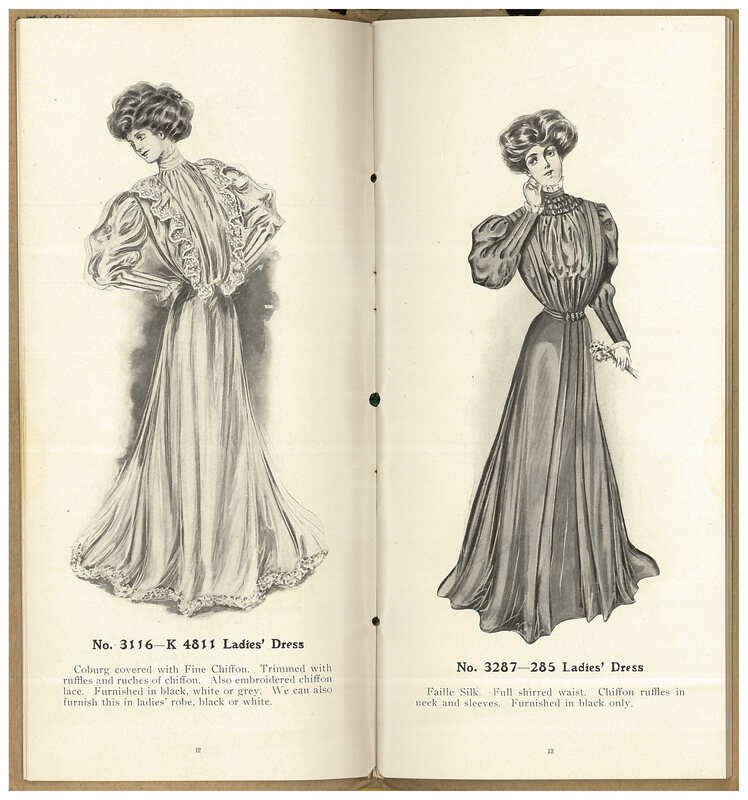 1915, pages 6-7, Ladies’ Dress No. 3327-240 and Ladies’ Dress No. 3225 C.
Much of the catalog focused on ladies’ dresses, but there were a few pages for men. The Sack Suit, made of broadcloth, is shown on the left while the Cutaway Suit, made of serge, is pictured on the right. National Casket Co., Baltimore, MD. National Styles, Dry Goods Catalogue 16-B, ca. 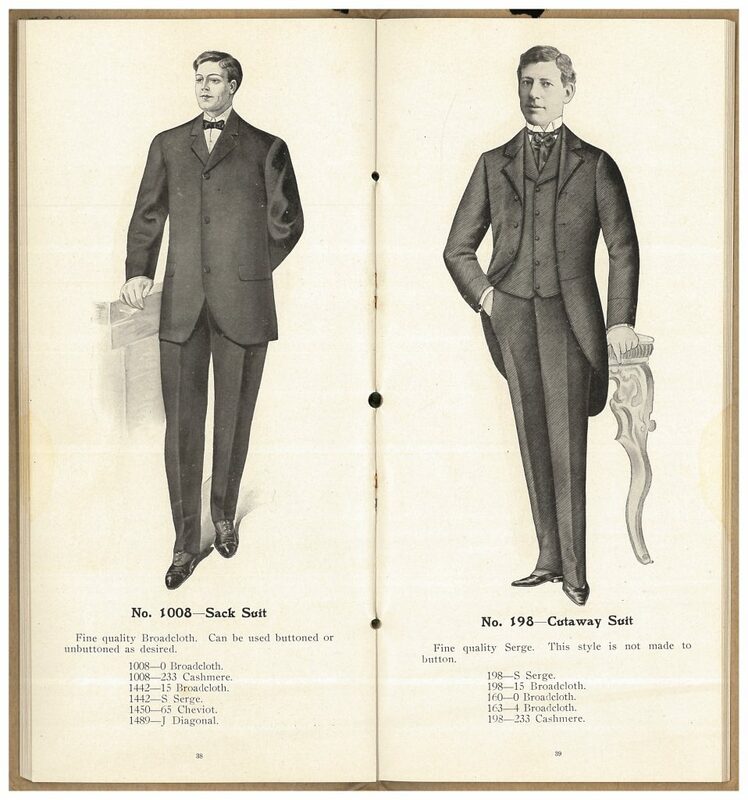 1915, pages 38-39, Men’s Sack Suit No. 1008 and Men’s Cutaway Suit No. 198. National Styles, Dry Goods Catalogue 16-B by National Casket Co. is located in the Trade Literature Collection at the National Museum of American History Library. Looking for more undertakers’ trade catalogs? Take a look at this post about coffin hardware and trimmings. Next Post Hard-edged, Bright Color: The Washington Color School. This is fascinating, but the 1915 date is in complete conflict with the style of clothing shown, which is much closer to 1905 than 1915. Strange. Thanks for your comment, Kathie. This catalog has no specific date on it, so we don’t know exactly when it was published. Our record for this catalog lists the date as “circa 1915” — probably just a guess by the library staffer creating the record. 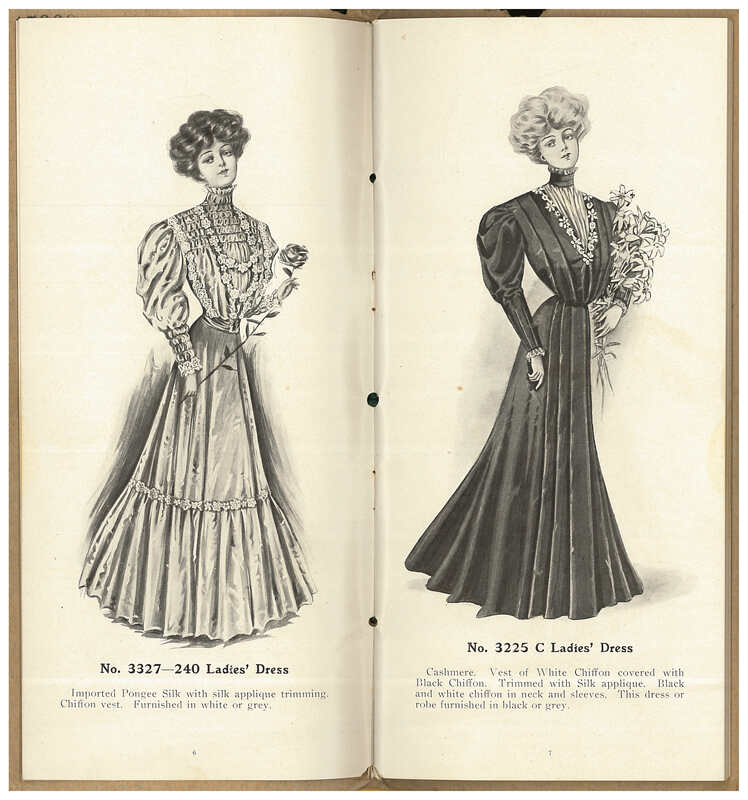 We agree with you — based on the clothing styles, it likely was published closer to the turn of the century. Thanks for the article. How were you able to access this and is there a way to get a copy? As mentioned in the post, this item is located in the Trade Literature Collection at the National Museum of American History Library. Although we are digitizing our collection, this item has not been digitized.